I must admit I've been putting off using Twitter. I love Facebook and Pinterest, and I did set up a Techie Mum account on Twitter some time ago, but I just didn't use it. However, one of the courses I'm teaching in a few weeks includes introducing my students to social media, so I can’t really leave Twitter out. The best way to make sure I'm up to date with it for my students is to bite the bullet and start using Twitter. So, Techie Mum is now actively on Twitter at @TechieMum. 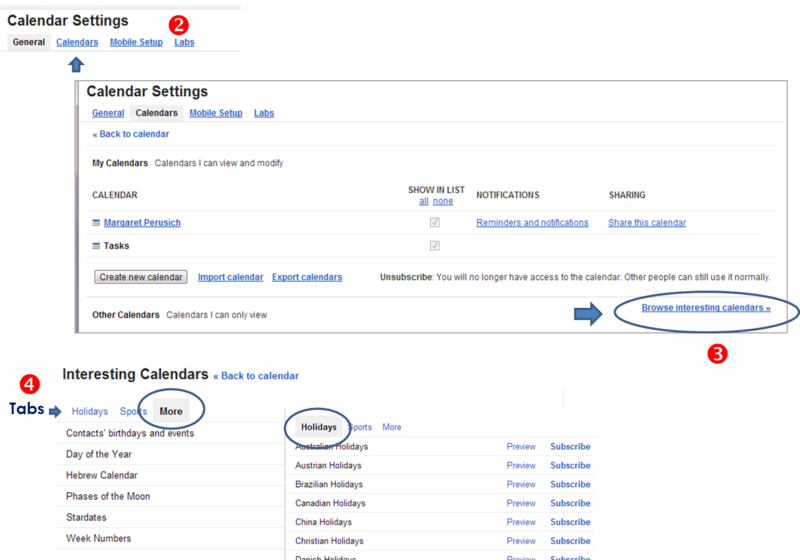 Do you use Google calendar/the calendar attached to Gmail? The best thing about it is that it is available to you, and up to date, wherever you are, on any device – any computer, any smartphone or tablet – Android, iOS, or Windows, either via a built-in calendar app or browser. As well as the appointments and events that you add to your calendar, you can have Google add other information to make your calendar even more useful. 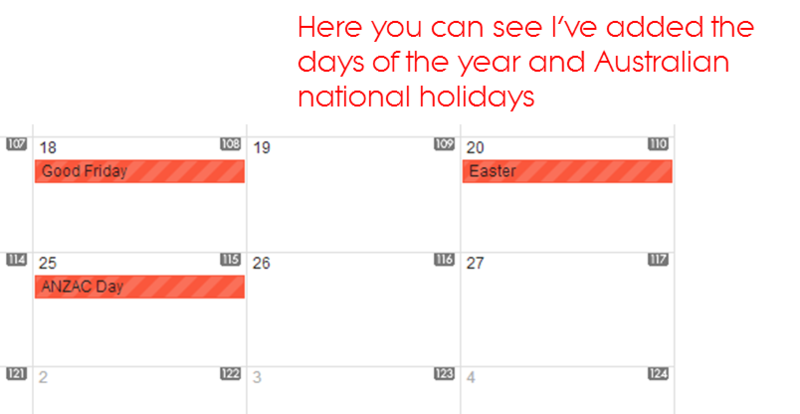 Holidays is where you’ll find the National holidays of 39 different countries - very handy if you do business regularly with another country, or have family overseas). In the Sports category you select the sport you want, then choose the fixture you want on your calendar. More is where you’ll find Phases of the Moon, Day of the Year, Star dates, the Hebrew calendar, and week numbers. You can preview and subscribe to various calendars. There are quite a few to choose from and you can choose as many as you like, although don’t forget they will take up room on your calendar. Once you've subscribed to all the calendars you want, go back to your calendar and you can choose what colour you would like for each. A different colour for your contact’s birthdays, another for holidays, and a different one for a particular sporting fixture. When you subscribe to any of these calendars they are added to your Google Calendar and they will appear on all your synced calendars on all your devices. 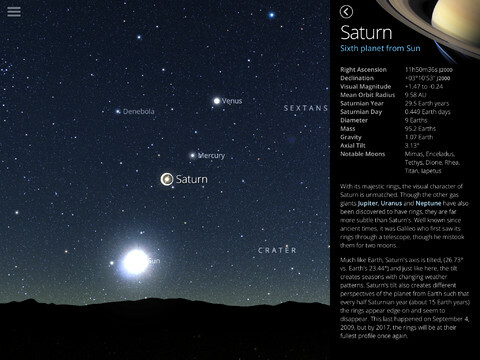 Just aim your iPhone or iPad at the sky and this app will identify the stars and planets in view. There’s no setup needed – just tap the compass icon and the app automatically aligns itself with your location. You can zoom in or out, search for particular planets, stars or constellations and once you’re taken to it on your screen you can also read articles by leading astronomers. Visually this app is stunning – it has been created using more than 37,000 actual photographs, which also means you can use it night and day. I only have Wi-Fi on my iPad, so I love that this app doesn't require any internet connection or GPS to function – I can use my iPad to identify the night sky anywhere at any time. We've been outside every night since I installed this app identifying the stars – great fun! Skyguide requires a gyroscope to work – so it won’t work with an iPad1 or iPhone 3GS or earlier. 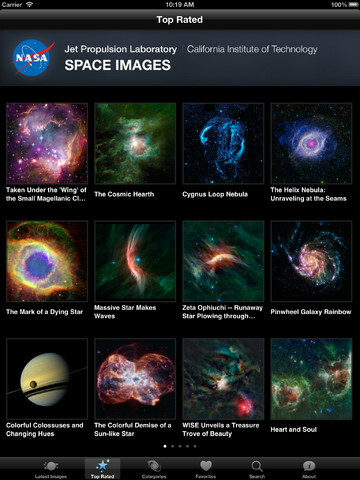 The NASA App features a constantly updating collection of content from NASA – images, videos, articles, Tweets, news reports and live streaming of NASA TV and radio. Anything new from NASA will appear on the app. You can read about every NASA mission, view photos from the Mars Rover, amazing images of the stars and planets, close to 10000 videos – just about anything you could possibly think of about space and space travel. When I first downloaded this app to my iPad it was about two hours before my boys and I put it down. 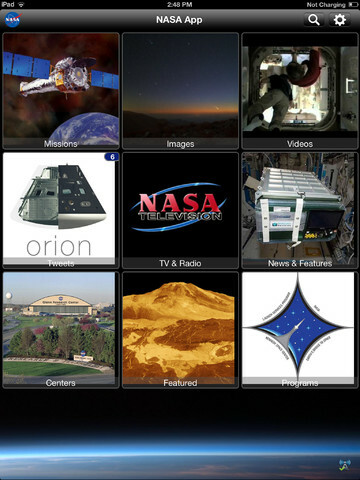 This app is from NASA’s Jet Propulsion Laboratory where they control the robotic exploration of space. From the Categories section you can select your favourite planet, asteroid, or the universe and be taken to the most amazing photos of each – there’s even a 3D category if you have some 3D glasses. For each image you can also tap the Info icon to read more about it. The unbelievable photos of planets, moons, galaxies and stars on this app can also be stored on your phone or tablet and used as backgrounds. 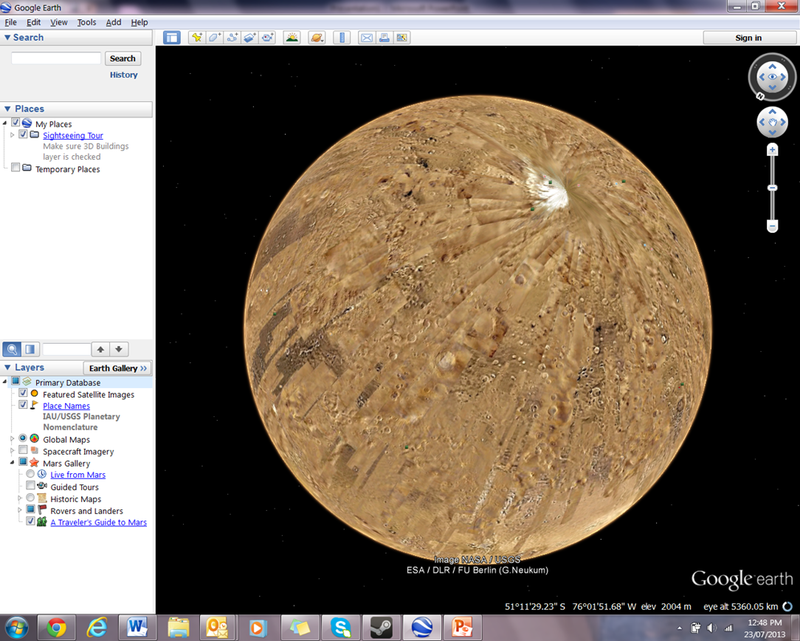 If you have the latest version of Google Earth on your computer, phone, or tablet, you also have access to Google Sky, Google Moon and Google Mars. 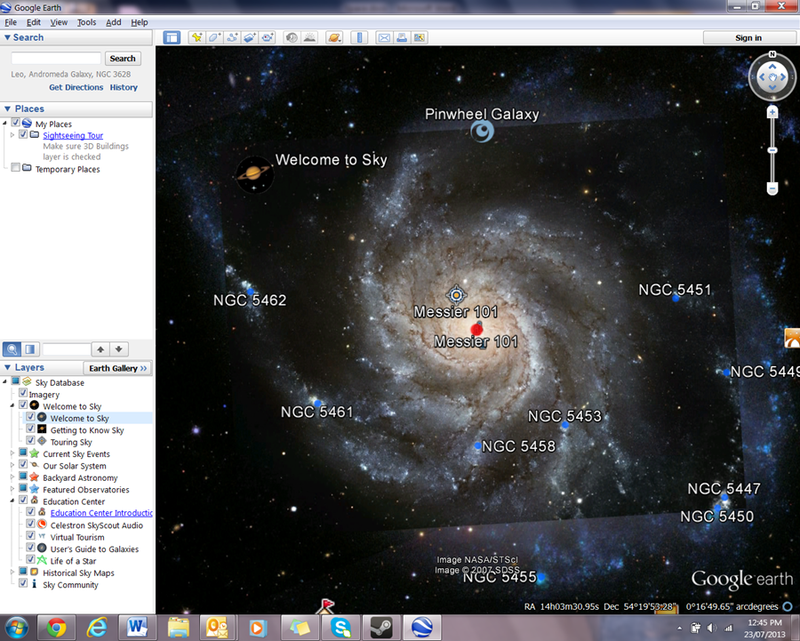 Just select which you want from the top toolbar in Google Earth. When you first select Sky you’ll be taken to a start screen from where you can visit the Education Centre, Historical Sky Maps, and more. 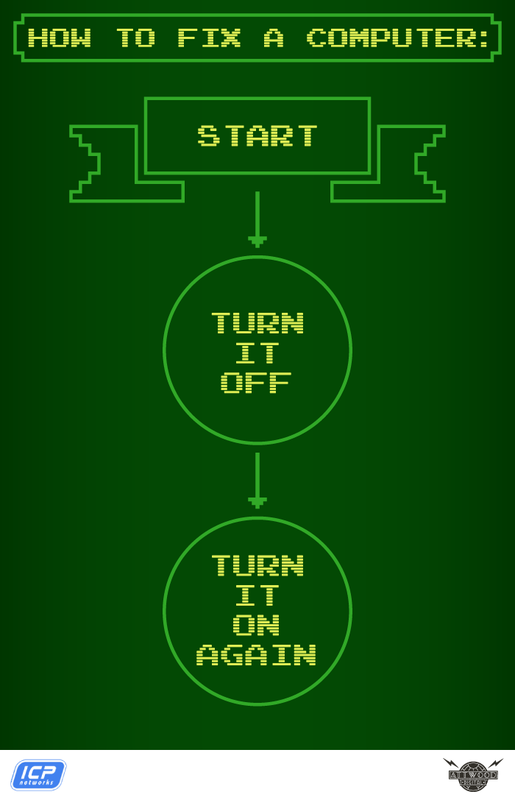 A good place to start is Welcome to Sky as it will show you how to move around. You can view the sky above your home, travel through space to planets, view constellations, hear astronomy podcasts, read loads of facts about space, and see live images of galaxies, objects and more from the Slooh Space Camera. 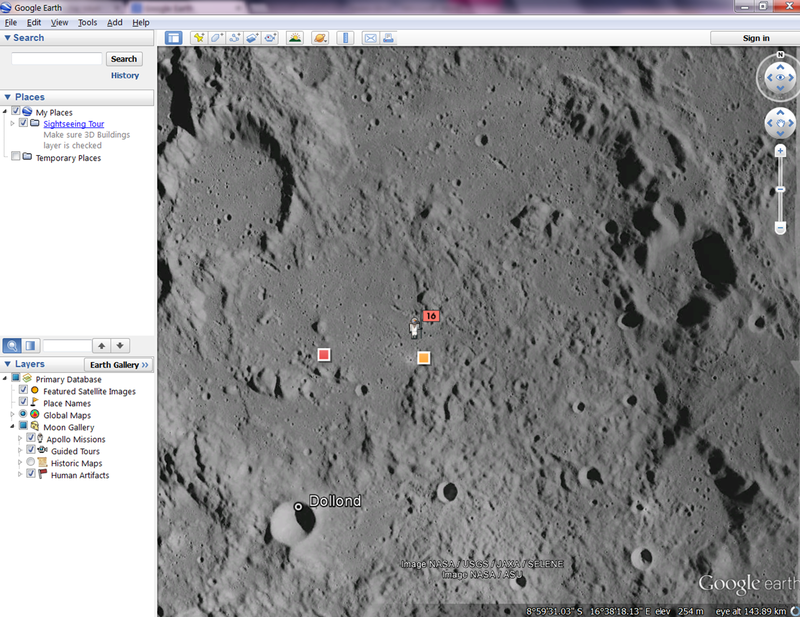 Use the filters on the left side of the screen to view or hide place names, Apollo landing sites, locations, human artefacts and more. You can take tours of the lunar landing sites, narrated by Apollo astronauts, and view TV footage of Apollo missions. View recent images from NASA, take an interactive tour of Mars, view 3D rover models and follow their route, and search for and view famous Martian landmarks. If you can recommend any other Space apps I’d love to hear about them. Do you know what a cumulative frequency histogram is, or Euclidean geometry? How about etymological knowledge or nominalisation? No, me neither! It is 35 years since I left school, so trying to help my 9 and 11 year old sons with their homework often results in frustration – for me, not them! But that is not going to happen this term! 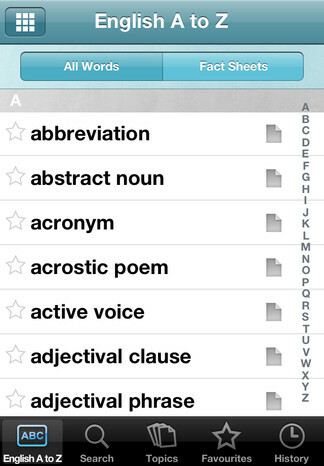 I have just discovered a brilliant app that I'm hoping will make all the difference at homework time. 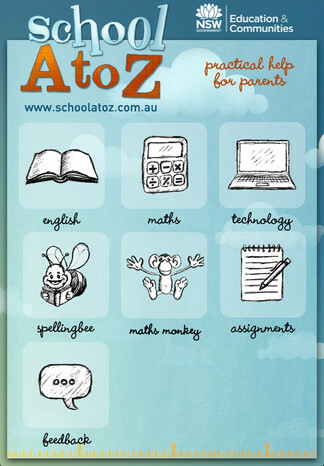 The School A to Z website has been around for a few years, but I didn't realise there is also a corresponding app. 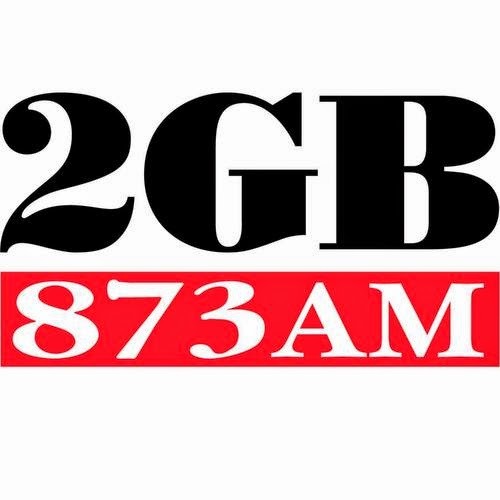 School A to Z is from the New South Wales Department of Education, but if you have kids at school it will be useful regardless of where you live. Within the English, Maths and Technology sections you’ll find A to Z listings of terms which, when you select one, displays an explanation, graphical examples of how it is used, and links to videos, fact sheets and more information on that particular topic. There are two sections just for your kids - The Spelling Bee is where they can practice spelling at an easy, medium or hard level or create their own list of words. Maths Monkey is for practicing times tables. Assignments is where you’ll find the themes that are currently in the NSW curriculum. Within each topic there are facts, videos, links to fact sheets and web sites where your child can find more information – perfect for projects. Get the app from the Apple App Store and from Google Play.